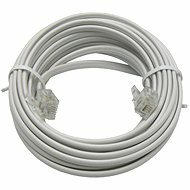 A standard 100m phone cord to connect the phone to a telephone wall outlet or VoIP gateway. 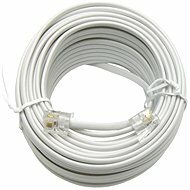 The cable is 4-vein and white. For shipping to other EU countries visit this page Datacom, telephone, 4-vein, white, 100m. Für Versand nach Deutschland, besuchen Sie bitte Datacom, Telefon, 4-Draht, weiß, 100 m. Chcete doručit zboží do Česka? Prohlédněte si Datacom telefonní, 4 žilový, bílý, 100m. Chcete doručiť tovar na Slovensko? Prezrite si Datacom, telefónny, 4 žilový, biely, 100m. Für Versand nach Österreich, besuchen Sie bitte Datacom, Telefon, 4-Draht, weiß, 100 m. Magyarországra történő kiszállításért tekintse meg ezt a termékoldalt: Adatátviteli telefonkábel, 4 eres, fehér, 100 méter.